Everyone has a theory about what the recession will "mean" for fashion. Wanna hear often correct New York Times critic Cathy Horyn's? Oh yes you do! The recession has already spawned its own language of buzzwords, as if the right combination of meaningful letters whispered in the consumer's ear will suddenly unlock her wallet: there's "investment" fashion, "green" fashion, the "new vintage." (That one sold out, so perhaps Stefano Pilati's on to something.) "Ethical" fashion. We're told there will be "slow" fashion, to match our slow food. There's the fantasy that we'll all start making our own clothes, and the competing theories that we'll have more of our clothes made in America — or that we'll continue having more made overseas. What this confusion of language speaks to is the underlying truth that this recession will permanently change the apparel industry — and the profound uncertainties that still cloud what those changes will be. How we dress, how we shop, how we are marketed to, where our clothes come from and who makes them are all up for reconsideration. The propagation of inanities like the concept of "investment" dressing is just evidence that even most industry experts are only grasping at straws, like the rest of us. Cathy Horyn was asked to speak on fashion and the economy last week at an event for Citi's Women & Co., a $125-a-year members-only women's professional organization run by the bank. Horyn's speech, a "trimmed" version of which she later posted to her blog, and then chased with more thoughts yesterday, amounted to a kind of fashion state of the union. This was the era when luxury groups were being formed — when Saint Laurent sold out to Gucci, when Bernard Arnault hired John Galliano and Marc Jacobs to shake up Dior and Vuitton respectively, when Prada made a bid for global power by buying Jil Sander and Helmut Lang, and when PPR eventually took control of Gucci...This shift from a largely craft-based, family-owned culture to a brand management culture mirrored what was happening in the financial markets, in the explosion in the art markets, and the excitement surrounding new architecture, particularly in countries like China and Dubai. Dress codes and divisions of all kinds have been breaking down for years — we scarcely notice when someone mixes high-low elements. But the late 90s and early 2000s saw fashion's ivory tower crumble a little more as designers became ardent marketers — selling the image rather than, in some cases, the clothes. In 2001, Marc Jacobs brought out the Vuitton bag splashed with Stephen Sprouse graffiti. It was followed by the Murakami bag, along with those indelible, digitally enhanced advertising images by the photographers Mert and Marcus. These designs were plainly creative, but the point is these bags were not precious objects. They expressed perfectly the blending of art and commerce, and insolence over elegance — a mood also conveyed in the ironic images of the photographer Juergen Teller, who for more than a decade has created Jacobs' ad campaigns for his own label, including the one of Victoria Beckham as a commoditized celebrity in a shopping bag. So the recession of 2001 did not throw anyone off the rails. In many ways, Louis Vuitton is the perfect embodiment of this grading-down of luxury. Until the 80s, Louis Vuitton was just another nice French handbag brand, perhaps known for quality and definitely known for high prices, sure, but not a "fashion" brand with much season-to-season variance, and certainly not a true "luxury" one either. Its coated-canvas monogram wares were widely available and sold in department stores like any other high-end bag; for nearly 20 years, handbags were even made under license for the U.S. market. Then that all changed: Louis Vuitton restricted the sale of its bags to its standalone boutiques, and started aggressively associating its bags with luxury and status through advertising. Naturally, the company raised its prices, which only raised its cachet. 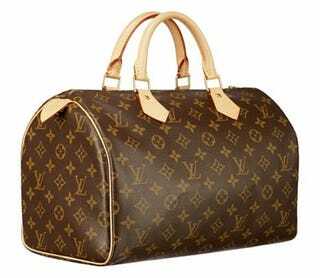 But the Speedy 30 that was sold off the shelf at Saks in 1980 is still fundamentally the same bag that runs $700 at Louis Vuitton's own store today. It was a triumph effected with marketing and precious little besides; the bags did not noticeably change or actually become more "luxurious" in their trip up from "good brand" to "luxury brand." But we bought them anyway. Now the deal isn't looking so good. In the mid 70[s], fashion was also a relatively small, familial world, with manufacturers forming relationships with stores through expert buyers, and styles evolving slowly. In 1975, a widely popular style was the quilted Chinese jacket, no doubt influenced by the opening of diplomatic relations with China. I am reminded of a conversation I had years ago with the comic Sandra Bernhard, who told me that when she began to do stand-up, she would include as part of her act a reading from Women's Wear Daily's pages. That's how strange and remote the fashion world seemed — those socialite names sounded exotic. By contrast, in the past decade, fashion has become a marketing tool for all kinds of non-fashion products, from stylish cell phones to boutique hotels. And, for better or worse, it has transformed urban neighborhoods, like the Meatpacking District in New York or South Congress Avenue in Austin, Texas. So what is next? And what are the issues on the table, according to Horyn? [T]his recession is different. Just about every luxury group and upscale retail chain has reported declines, and no category, with the exception perhaps of watches, is performing very well. Private investment in fashion companies is virtually non-existent, and there is very little acquisition activity. Of course, part of the problem is over-capacity — there's just too much stuff around. That's not strictly true; certain luxury categories are performing well. Hermès leather goods division — the sector of the company that sells $50,000 crocodile handbags with a three-year waiting list — experienced a 21.7% jump in sales during the first quarter of this year. (It's the expensive but comparatively lower-priced goods, like watches and perfumes, that aren't doing so well for the French brand.) But other luxury companies are deeply troubled. Harry Winston and Tiffany's both just released quarterly results that were marked by steep losses. Horyn sees the industry facing challenges along two primary axes. For one, there will continue to be steep growth in consumer spending in emerging markets, like Asia and South America — especially at the high end of the retail continuum. While the recession might be stalling luxury spending in Japan, it won't stop growth in China and India. It can't. At the couture shows in Paris this January, the happiest man around was the consultant who helps introduce wealthy Indian women to the designers and advises them on which pieces to buy. (And by "piece," we are talking here of $75,000 dresses.) These consumers will be predominantly under 35, and they will want "real" luxury — not $4,000 Prada it-bags that only hold any allure for a season. There's a reason they're going to the Paris couture collections. As for the rest of us? Horyn thinks the designers that will be successful over the coming years and after the recession will be those who cast off "history-minded" dressing and think instead of, wait for it, the future. It involves thinking of the consequences of technology, and relating these changes more imaginatively to how we dress, how we shop — the design of stores, the potential of online magazines and stores. A "sartorial consciousness," to use Quentin Bell's term, is not limited to moral indignation; it also applies to the raw materials, the energy sources, and labor practices used in making a garment. "Green fashion" will become more and more important, and young consumers in particular will expect to see innovation and experimentation in this area — the kind they see in proposals for wind-powered skyscrapers and carbon-free transportation systems. Indeed, I am somewhat surprised that a big luxury group has not had the foresight to create a separate eco-brand of high-quality garments, with a casual yet sophisticated aesthetic. We've seen a number of niche labels, but not one that draws on the brand power and advertising reach of a luxury group. Perhaps that's exactly what LVMH is thinking in acquiring Edun, and bringing its tremendous marketing resources and distribution network to bear on the organic cotton, sustainably-made fashion line. a great many people in the fashion world would share the photographer Horst's view that "fashion is a universe full of art and excess where no one thought of the outside world," even though that statement was made about the late 1930s. This may be why many designers do not know how to fully relate the Internet to fashion — imaginatively. I mean only that it took radio roughly 40 years to reach 50 million people, while it took the Internet just 4 years to reach the same number of people. This is the dynamic that fashion must embrace in the coming years in order to be truly creative and relevant. It's great to talk about "slow fashion" and the value of handcraft in informing our imagination. These qualities will still be important, as Paris is, but imagine the other system of thought that revolts and finally breaks free of the old world. If that's the future of fashion, I want to be there to see it. Provided it costs less than $700 for a canvas bag.